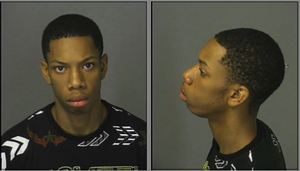 Posted on Fri, Feb 3, 2012 : 2 p.m.
Washtenaw County Sheriff’s Office deputies are looking for Kerry Winn, a 24-year-old man wanted in connection with a shooting in early January, police said Friday. Winn is known to carry a handgun and is considered armed and dangerous by police, according to a sheriff’s office statement. Winn has two previous convictions for use of a narcotic, cocaine/meth/ecstasy and for possession of less than 25 grams of cocaine. Winn is wanted in connection with a Jan. 7 shooting police are calling an attempted murder in the 200 block of Stevens Drive in Ypsilanti Township. Sheriff's office spokesman Derrick Jackson said police responded to St. Joseph Mercy Hospital at 5:48 p.m. Jan. 7 for a a report of a gunshot victim in the emergency room. The shooting occurred at the home on Stevens Drive, Jackson said. The 21-year-old Ypsilanti man was with his sister and Winn at the home. Winn and the victim's sister were dating, Jackson said. The victim and Winn got into a verbal altercation, and police believe Winn pulled out a gun and shot the man in the leg, Jackson said. Winn is black, about 5 feet 6 inches tall, weighs about about 130 pounds and has a birth mark on his left arm near his elbow, police said. Anyone with information on Winn’s whereabouts is encouraged to call the Washtenaw County Sheriff’s Office anonymous tip line at 734-973-7711. Sun, Feb 5, 2012 : 1:57 p.m.
That is an old picture of him (from 2009). He does not look like that anymore. Maybe you should get his most recent photograph so the community knows what to look for. Sat, Feb 4, 2012 : 11:31 p.m. Sat, Feb 4, 2012 : 11:07 p.m.
As I see this picture I am reminded of a song by Elivs Presley. In The Ghetto....and his mama cries. What a waste. Sat, Feb 4, 2012 : 7:11 p.m.
No family structure and TV as a role model. Sun, Feb 5, 2012 : 3:58 p.m.
Todays television anyways. I see so much violence now then before that I just don't watch unless it is a BBC broadcast. American television needs to tone it down. Sat, Feb 4, 2012 : 12:19 a.m.
Just as Charlie Sheen says....&quot;WINNing&quot;. Sat, Feb 4, 2012 : 12:03 a.m.
Not trying to start an argument here but seems like there have been some murders and suspected murders in some the wealthier communities too lately. The woman who was murdered from the Gross Pointe area and her body found in Detroit, husband a person of interest, just to name one. Fri, Feb 3, 2012 : 10:22 p.m.
Why does it seems that people who live in poorer neighborhoods can't seem to control their temper and the only way to settle a dispute is with a gun? Sat, Feb 4, 2012 : 11:06 p.m. I blame the president and everyone on down for the problems this man is having. Government is to blame. Pure and simple. Sat, Feb 4, 2012 : 6:10 a.m.
Fri, Feb 3, 2012 : 10:53 p.m.
Fri, Feb 3, 2012 : 10:21 p.m.
How is it that when you read an article about shootings/murder/attempted murder, the chances are pretty good that it will be in West Willow or in this case--Macarthur Blvd? Sat, Feb 4, 2012 : 6:03 a.m. There are 2 Stevens drives. One off Congress and one between Ypsi Twp and Superior Twp. That one might actually be spelled Stephens. Fri, Feb 3, 2012 : 11:46 p.m.
Stevens Drive is off of Congress, near Hewitt, not even close to Macarthur. Fri, Feb 3, 2012 : 9:57 p.m.
24 years old, what a waste of life. I guess he is really armed and dangerous, and using drugs to boot. Hoping he is caught soon, but all need to be very careful as they approach him. Does this thug have a permit to carry? I trust WCSD will find him. Fri, Feb 3, 2012 : 9:28 p.m. This is not the proper way to end an argument but it is becoming the norm nowadays. Fri, Feb 3, 2012 : 9:51 p.m.
@The Black Stallion3, it does seem that way doesn't it? What ever happened to if an argument escalated if may have just result in a fist fight and a few bruises? Fri, Feb 3, 2012 : 7:14 p.m.
5'6&quot;? That explains the mug shot angle.